Home | History | Products | Courses | Tools & Supplies | Contact Us Dominique Jarry Sugar Art Inc.
Dominique Jarry Sugar Art Inc. is a unique business offering a variety of products and services. 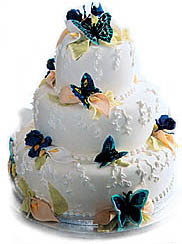 While specializing in custom cakes, pulled and blown sugar, and chocolate sculptures; private classes in pastry art are also available, as well as a wide range of professional pastry tools and supplies. All works on this page are copyright 2003, Dominique Jarry Sugar Art Inc.